We all know that Martha Stewart is the queen of home made, creating beautiful things, and a business savvy wonder woman! So when I heard about this awesome opportunity I knew I had to pass it along since so many of my awesome readers are also amazingly talented and business savvy wonder women. 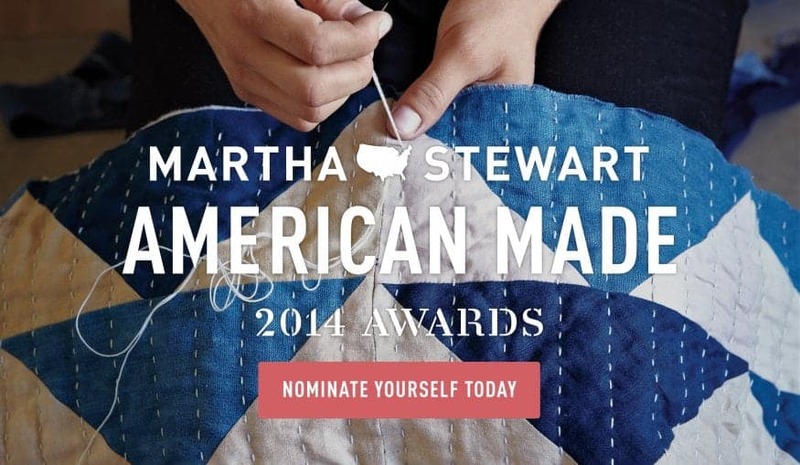 Martha is celebrating our most talented American makers with a special award and some prizes I could only dream of winning! If you are an American maker or know one, read more details on how to nominate someone for the award below. Are you an American Maker? Or do you know a talented American maker? Martha Stewart’s American Made Program spotlights the maker, supports the local, and celebrates the handmade. Through the 2014 Martha Stewart American Made Awards, Martha, her panel of judges, and the American Made community are selecting the next generation of American Made entrepreneurs, those who are creating beautiful, inspiring, useful products; pioneering new industries; improving local communities; and changing the way we eat, shop, work, and live. The American Made Awards recognize ingenuity and excellence in the fields of crafts, design, food, and style. Prizes for each of our 10 winners will include a trip for two to New York City, a spot in the American Made Market, an opportunity to be featured in Martha Stewart Living, $10,000 to grow your business, and much more! To be recognized, nominations must be submitted before August 29th.